Whether you have been using a camera for many years and are a proficient shooter or you just acquired your first camera and are starting out, everyone's instinct is to put the viewfinder to their eye to see what the camera sees. PGD Tracker exists because looking through the viewfinder with a telephoto lens attached presents significant challenges when trying to shoot fast moving targets. Using the PGD Tracker gets your head up where you can see the world with both eyes. We are going to look at the various ways to hold your rig while using the PGD Tracker. On most DSLRs the hot shoe, and thus the Tracker, is above and centered over the eyepiece and lens centerline. Notice that the reticle is centered over the middle rib on top of the Tracker body. Use this visual reference as you practice raising your head from the eye piece to the tracker and back again. It does not take long for this to become a "muscle memory". knowing where to find the reticle quickly is fundamental to using the Tracker proficiently. Your eye line of sight will be about 3/8" above the back of the Tracker. Note that the reticle is centered on the Tracker lens. Reticle calibration is not very sensitive to your eye being a bit left or right of the centerline, but vertical calibration is, so practice using the visual references so your line of sight with the reticle is consistent. On a typical DSLR it is possible to place the back of the camera against your chin and have your eye directly behind the tracker, perhaps 4” away from the tracker lens. With your lens holding elbow tucked into your chest and directly under the lens, this “3 point” hold can provide a very steady stance. This would be very desirable if you happened to be shooting video, or are forced by light conditions to use a lower shutter speed than would be ideal. It is also the least tiring for holding heavy rigs for extended periods. 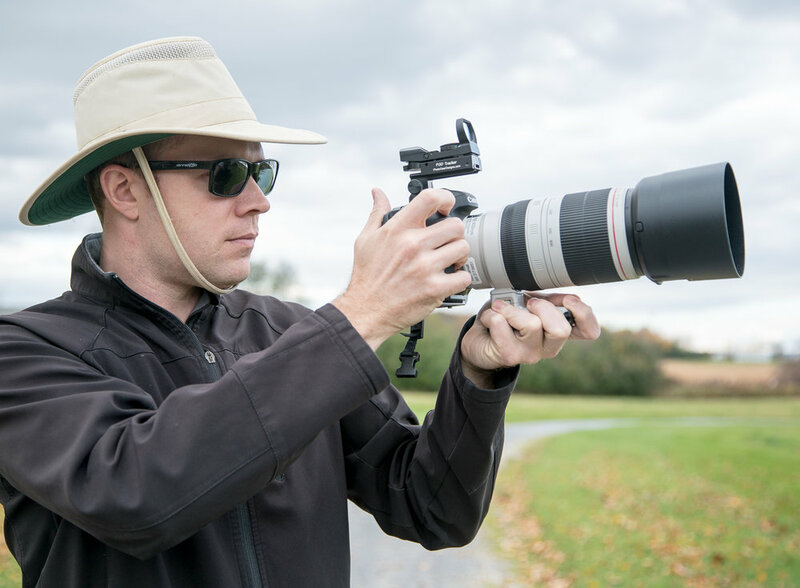 Using a typical zoom telephoto of the 100-400mm variety and with a target suddenly coming into sight, holding the camera 8-12” forward of your eye makes it easier to swing the camera and Tracker into position for quick target acquisition. If you are using a sling for your camera, this is a natural stance for very quick response to a surprise target. Use a stationary target and practice quickly swinging your rig up, placing the reticle on the target and firing. After getting used to the motion, transition to common birds or other moving targets. A little practice will improve your technique and success rate. Think of it as a video game. It's fun! The alternative to free hand shooting is tripod and gimbal supported shooting. Large and fast prime telephotos are very heavy and most folks can not hand hold them for very long before tiring. Since a lot of wildlife shooting means waiting patiently for the action, using a tripod and a gimbal mount works very well. In this scenario, it makes more sense to keep your head back at a comfortable distance. With the camera pivoting horizontally and vertically near the CG of the rig, the photographer has to be prepared to move quickly left or right to maintain tracking. Positioning the tripod legs to minimize tripping over them is a good strategy. 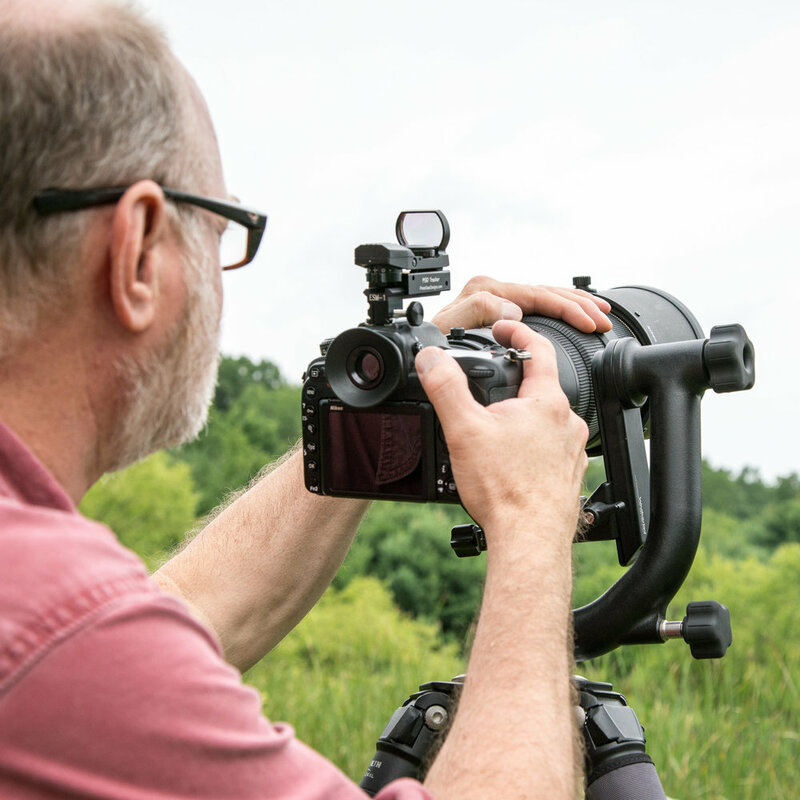 It is not uncommon for dedicated wildlife shooters to have long heavy lenses on a tripod supported gimbal mount and a shorter lighter lens on a second body for potential close subjects and fast freehand shots. (We offer a 15% discount for an order of two or more PGD Tracker Kits). Since the Tracker is an assisting device, it does not mean you are using it exclusively. Suppose your intent is to capture a bird’s activities after it lands. The Tracker allows you to follow the bird, but once it lands, go back to the camera’s view finder for more precise framing and focusing. Perhaps you have spotted wildlife in complex cover at some distance. Locate the subject with the Tracker, then transition back to the viewfinder. Practice and personal preferences will become apparent as you gain experience with the Tracker and it becomes an integral part of your wildlife shooting. If you need to refer to the instructions, click here.